Bertha’s skill with correspondence was used to help her grandmother in at least one instance. When fellow Issaquah pioneer Tom Cherry died in 1899, none of his family lived in the area. Bertha had known him virtually all her life, having lived with her aunt and uncle, Emma and Cyrus Darst, at the same time he did, when Bertha was three years old. Three days before he died, he wrote a will in which he appointed Martha Stewart Bush as his executrix. The will was witnessed by P. J. Smith and John Robertson and notarized by J. H. Gibson. Tom’s siblings and their descendants were back in Arkansas (where they had been when he started moving west on his own), Texas, and the Indian Territory (now Oklahoma). His brother James Madison Cherry wrote four times to Bertha, thanking her for telling him what was going on with the estate and lamenting his inability to engage a competent and faithful lawyer to represent the family’s interests. By the end of the correspondence, he was writing about his daily activities and hoping to stay in communication with Bertha. The probate records are preserved as case number 3314 in the Washington, Wills and Probate Records, 1851-1970, and are available through Ancestry.com. What they show is a situation complicated by distance and communications issues. In essence, Tom left “My best friend, Mrs. Martha Bush,” his executrix, the sum of $1000. 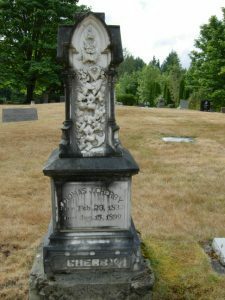 The rest of his estate, beyond his debts and $500 set aside for his burial and monument (still visible in Issaquah’s Hillside Cemetery) was to be shared among his family. There were problems, though, which only show clearly if the correspondence is added to the probate records. The bulk of Tom’s estate was eighty acres of land near Lake Sammamish (described as S.E. 4 of NE 4, SW4 of NE4 >Section 20/Township 24/Range 6), valued at $5500.00. There were also personal goods and some cash and notes on hand. Martha discharged all of the debts and sold the small items, including the violin valued at $3 that is now in the IHM collections. She then had to petition the court for permission to auction the land in order to have enough cash to carry out the specified distribution. I written Benson about a month later + When he found I had Written often lawyers he answered at once + they did two he thought I knew no other lawyers + he would get 10 percent Jacobs had never Written me yet I got papers for all of the heirs to Sign + have Sent them on and Signed With the others here and Sent Back to Nobel. Jacobs was probably the colorfully named Orange Jacobs, the court appointed Guardian ad Litem representing the minor children in the residual pool. The estate had had to petition the court to appoint one to represent them at the hearing to authorize the sale of the land. Thomas Jefferson Cherry’s will and probate records are a wealth of information for anyone wanting to trace the Cherry family. The major caveat is that his will is not the accurate recounting of his siblings that one might assume. To have a complete and accurate account of the family as his heirs, see pages 296, 299, and 300 of the probate records for Estate #3314 in the Washington, Wills and Probate Records, 1851-1970, available online through Ancestry.com.